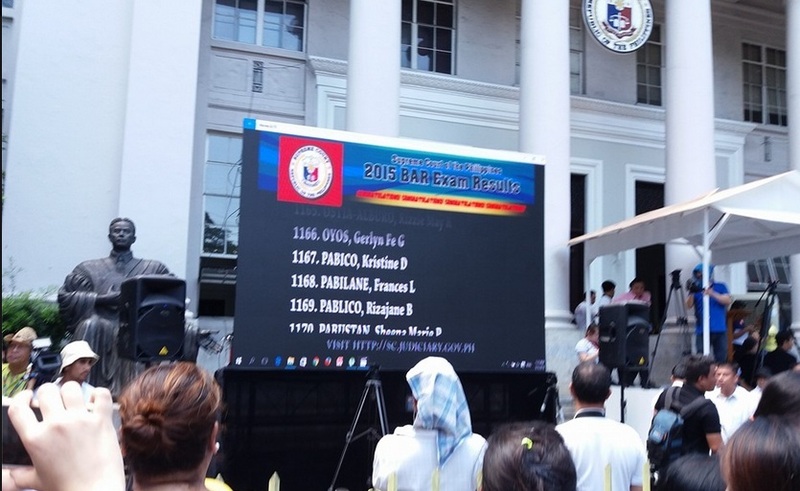 Four graduates from the University of the Philippines (UP) College of Law landed at the top 10 of the 2015 Bar Exams. UP grabbed the top spot with Rachel Angeli Miranda getting the highest rating of 87.25 per cent among the Bar exam passers. The prestigious state university also grabbed the third spot with Jayson Aguilar getting 86.75%. Sixth place went to UP grad Giselle Hernandez (86.10%) and ninth place was secured by Jedd Brian Hernandez (85.8%). Three Ateneo University graduates bagged the 4th, 5th, and 8th place while University of San Carlos (USC) graduates took the second and 8th place. The passing rate for the Bar exams held in November 2015 is 26.21 per cent since 1,731 out of 6,605 examinees made it. The Supreme Court announced the results on Tuesday, May 3. Examinees and relatives waited outside the Supreme Court Building in Manila hours before the announcement. As expected, emotions ran high as the examinees and their companions reacted to the results of the Bar exams. A lot of the Bar exam passers announced their achievement on social media, posting photos of documents with their names encircled or highlighted. Others shared pictures of their name as it was flashed on the screen outside the Supreme Court building.